This classic Australian musical takes place on the streets around the actual Hayes Theatre Co. in Sydney’s inner eastern suburbs of the 1920s and 1930s. Celebrating the show’s 30th anniversary, Hayes Theatre Co will present a new production of Darlinghurst Nights from Helpmann Award-winning director Lee Lewis. Darlinghurst Nights explores the seductiveness of a life authentically lived, of a world where people can live without fear of intolerance amidst Sydney’s most colourful strip. Set during the 1920s and 30s, and inspired by Sydney poet Kenneth Slessor, writer Katherine Thomson (Diving For Pearls) and composer Max Lambert (Miracle City) capture a time when Kings Cross was the only place in Sydney where a person could live anonymously; where bohemian lifestyles were accepted and even encouraged. The three women in the story – Mabel, Cora and Rose – come from different backgrounds and find themselves in different situations, but they are all fighting against the restrictions imposed on them by society and circumstance, and are searching for a way to live the lives they want for themselves. At another moment of existential upheaval for Kings Cross, Darlinghurst Nights takes us back 80 years to a world we recognise, but are in danger of losing. The show was first produced by the Sydney Theatre Company in 1988 where it was a phenomenal success, and was revived in 2000 for the Olympic Arts Festival at Sydney Opera House. Cast includes: Baylie Carson (Dusty, Hello Dolly) as Mabel, Andrew Cutcliffe (Melba, Calendar Girls) as Frank, Natalie Gamsu (Ladies in Black, Strictly Ballroom) as Rose, Abe Mitchell (Paper Planet, A Riff on Keef) as Spud, Billie Rose Prichard (A Midsummer Night’s Dream, The Dark Room) as Cora, Sean O’Shea (Dinner, Rupert) as Ken, and Justin Smith (Assassins, The Detective’s Handbook) as Joe. 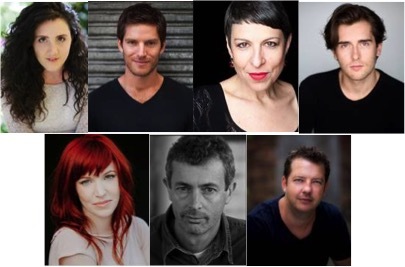 This musical is an original concept by Andrew James based on the book DARLINGHURST NIGHTS by Kenneth Slessor, with music by Max Lambert, direction by Lee Lewis, and choreography by John O’Connell.